Fry the onion in the large casserole dish on a medium heat for 5min. Turn up the heat and add the chicken, cook until golden brown and cooked. Turn down the heat and add the vegetables and thyme. Cover with a lid or tin foil and allow to cook at a low temperature until the vegetables are tender. Pour in the Carnation Evaporated Milk, add the stock pot and allow to cook for another 10 min until the sauce starts to thicken. Season with black pepper to taste. 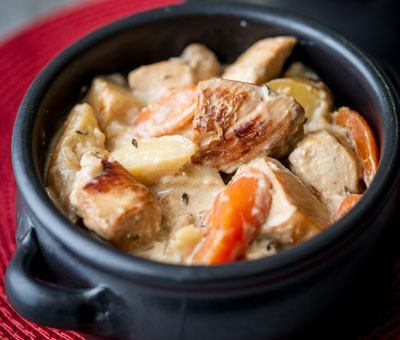 One Pot Chicken Casserole is rated 5.0 out of 5 by 1. Rated 5 out of 5 by Potty 56 from DELICIOUS Have made this several times for friends and family, (I use a whole tin of milk) and everyone loves it.